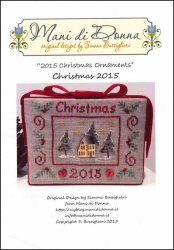 2015 Christmas Ornaments: Christmas 2015 [G5165] - $12.00 : Yarn Tree, Your wholesale source for cross stitch supplies. Cross Stitch pattern from Mani di Donna. Get in the Christmas spirit by stitching this Christmas ornament. It's a cold winter day with snow decorating the trees & blanketing the ground outside the warm, cozy home. The stars are shining brightly in the midnight sky. A holly border with "Christmas" stitched at the top, completes this design. The house button is included with this design. Stitch count is approximately 80W x 60H.